Our galleries are closed at the beginning of this month as we install a major exhibit from Pompeii, Leisure and Luxury in the Age of Nero. So I’m taking this opportunity to feature a favorite Kelsey ugly object that is rarely on view: an ancient dirty sock. In the photo below, you see the part of the sock that would cover your toes and the front part of your foot (the heel and ankle are missing). Knitted Sock. Wool. 2nd – 4th c AD. KM 22558. The sock was excavated at Karanis, Egypt, during the University of Michigan’s 1928 field season. This object is hideous, accessible (who doesn’t have daily experience with dirty socks? ), and interesting. It’s obviously old, stained, and worn, with a large hole in one toe. But it’s also a very cool, very early form of knitting called single-needle knitting or nålebinding. I could tell you more about this technique, but why not try it yourself by making your very own ancient-Egyptian-style sock? The Petrie Museum of Egyptian Archaeology in London did this in 2009 and 2010, in an experimental archaeology project called “Sock It!” Scholars used ancient techniques to recreate a pair of socks just like this one. Click here to read their blog about the project, and here for instructions and a pattern to do it yourself. February is a great month to make yourself a cozy pair of ancient ugly socks! Here in the conservation lab, we’ve been busily preparing for the upcoming exhibition Ancient/Modern: The Design of Everyday Things. One of the objects in the exhibition is this child’s garment, excavated from the site of Karanis, Egypt, in the 1920s and ’30s. The dry Egyptian desert creates excellent preservation conditions — so much so that even fragile organic materials like this textile can survive for 2,000 years. Last month, Kate Carras wrote about her favorite textile fragment from Karanis. 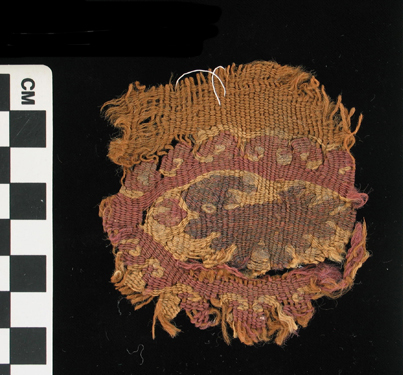 Her favorite fragment was made differently from the garment shown above, but the materials are the same: wool yarns. You might wonder, how do we know for sure what kind of yarn it is? How do we know that it’s not linen or cotton? 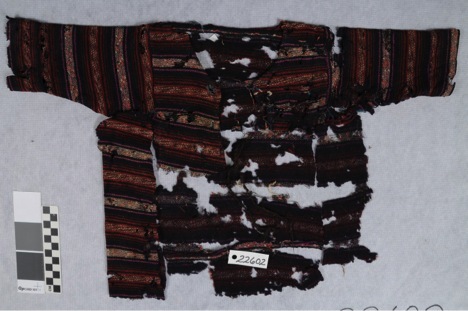 In the case of this garment, there was a meticulous analysis of the weave pattern and yarn structure in the object’s records but no identification of the fibers present. Knowing the fiber type is important for conservators because it helps us make good decisions about how to care for the textile. When we want to identify the fibers that make up a yarn, we carefully take a tiny sample of the fiber to examine with a microscope. (left) Photo-documentation of the blue warp sample location. (right) The labeled sample temporarily mounted on a glass slide with water. We mount the sample on a glass microscope slide by placing a drop of water over it and a glass coverslip atop the water. The water serves both to improve the optical properties during examination and to hold the fiber in place. What are we looking for? Different types of fibers have different surface clues, or morphological features, that tell us whether they are wool or hair (from an animal), cotton, linen (from the flax plant), or another type of bast fiber (also from plants). In this case, it looks like the samples are all wool. (left) Dark blue warp fiber, magnified at 200x. (right) Fiber sampled from a pink weft, also magnified at 200x. 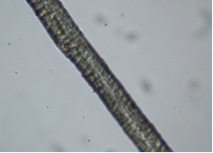 The scales suggest that the fibers are both wool. A beige weft sampled from the proper right sleeve, magnified at 50x, also wool. The first clues that the fibers are wool are the small, jagged lines (called scales) visible on the surface. The second clue is a feature called the medulla — the central air space that travels the length of the fiber shaft. In this image, the medulla is faintly visible as a slightly darker column traveling down the center of the fiber (50x). Though time did not permit us to investigate further, other methods can be used to narrow down the source even further, to a class of animals — for example, goats or camelids. Identifying the fibers used in a textile contributes to archaeological research, determines what conditions are best for a textile’s preservation, and helps direct future conservation treatments.